Save water. Save money. Save your vehicle! McKee's 37 Rinse Free Wash & Wax is packed with lubricants that wrap around dirt and grit to elevate it just above the paint surface. Specialized polymers grab dirt and trap it within the slippery solution of lubricants and water. As you wipe the wet surface with a microfiber towel, the dirt will stick to the towel, not the paint. Upon drying the surface, it will feel super slick and have an incredible gloss. In fact, McKee's 37 Rinse Free Wash & Wax offers more surface protection, slickness, and shine than any other quick wash or rinseless wash on the market! This is where the polymers really shine! The proprietary polymers bond to the paint as the lubricants allow dust and dirt to be wiped away scratch-free. The polymers leave a slick, high gloss finish that is a brilliant complement to any existing wax coat. Since McKee's 37 Rinse Free Wash & Wax is water-based, it’s safer for you and your vehicle. Enjoy the slick shimmer and convenience of a quick detailer with no harmful chemicals! 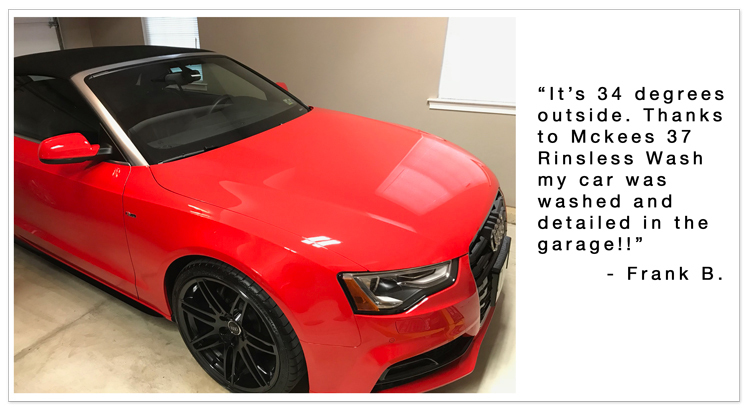 McKee's 37 Rinse Free Wash & Wax is ideal for maintaining a clean vehicle when a traditional car wash is impossible or impractical, like during the winter or in water-restricted locations. McKee's 37 Rinse Free Wash & Wax is ahead of the curve with its water-based, environmentally friendly formula. Because there’s no need to rinse, there are no chemicals running into storm drains and then into local lakes and streams. (Storm drain water does not receive any filtering or processing before entering the local surface waters.) Eliminating run-off preserves the water quality in your area, which is better for you, your neighbors, and the environment. McKee's 37 Rinse Free Wash & Wax contains non-petroleum lubricants that are readily biodegradable and nontoxic. This creates a drastic reduction in VOCs, well below the standards set by the California Air Resources Board and the federal government. No matter what the dilution ratio, McKee's 37 Rinse Free Wash & Waxs is safe for the user and the vehicle. And it replaces many products that are not so safe, like oil-based quick detailers and lubricants. So, you can breathe easier and save a little cash in the process. Environmental consciousness is important, but the most compelling feature of McKee's 37 Rinse Free Wash & Wax is that it works. Used as a rinseless wash or a quick detail spray; this product delivers real results. Rinseless Wash - Dilute 1 ounce of super-concentrated McKee's 37 Rinse Free Wash & Wax in TWO gallons of water.Soak a microfiber towel or sheepskin mitt (any paint-safe wash tool will work) in the mixture and wash the vehicle one section at a time. Re-wet the towel or mitt as needed. Note: Use the two-bucket method to further protect your vehicle from wash-induced swirls. Rinse the wash tool in a bucket of clean water before re-wetting it in the wash bucket. Dry each section with a second clean microfiber towel. Quick Detailer - Add 2 – 3 ounces of McKee's 37 Rinse Free Wash & Wax to 32 ounces of water. Pour this mixture into a clean spray bottle. Mist the paint surface and wipe with a clean, soft microfiber towel to rejuvenate the shine and remove fingerprints and dust. The remaining mixture can be saved for use at a later time. Shake the bottle well before using the quick detailer again. If you’re looking for a cleaner that can be sprayed on and wiped off, take a look at McKee's 37 Waterless Wash On The Go. It requires no dilution and is excellent for quick cleaning when you’re away from home. All you need is a soft microfiber towel to wipe away dust, fingerprints, and fresh bird droppings.